Despite close set scores, the Leafs dropped two matches 3-0 to Siena Heights University (SHU) and Geneva College on Saturday. In the first match against Siena Heights, a team receiving votes in the national poll, SHU opened with a quick 25-15 victory in the first set, propelled by 15 kills and a 66.7 percent hitting. The second set, however, proved more competitive. While the Saints preserved their lead in kills, with 14 to Goshen’s 10, the number of errors committed by each team were equivalent with seven each. The second set was a back-and-forth affair, with neither team gaining more than a three-point advantage at any time throughout the set. With the score knotted at 22-22, the Saints pulled out a near-miraculous three-point streak to finish the set 25-22. Undeterred, the Leafs rallied in the third set to trail by just one, 11-10. 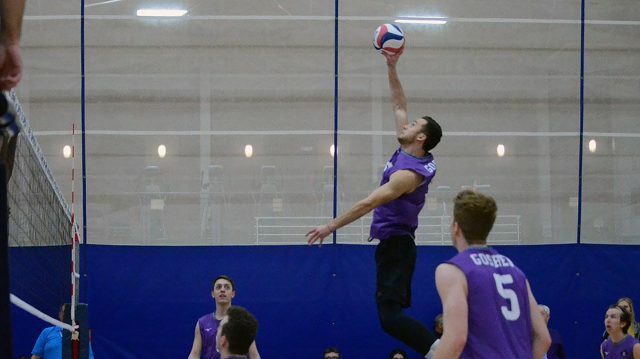 Unfortunately, a strong offensive attack from SHU sparked a 12-6 run that forced the Maple Leafs into a 23-16 deficit, culminating in a 25-18 set loss. Goshen was led by Michael Wahl and Alexander Rabadzhiev with 11 and 12 kills, respectively. Lucas Sauder contributed a team-high 26 assists. Isaac Longnecker chaired the defense with six digs. The efforts of this trio, however, could not overcome the well-rounded SHU attack of Chaidez, Cashen and Garavalia, highlighted by Cashen’s 12 kills. As a team, the Saints’ 42 kills to Goshen’s 29 ultimately seemed to be the difference-maker, with SHU posting 0.354 percent hitting to Goshen’s 0.137 percent. Goshen’s second match of the day was even more competitive than the first: against Division III Geneva College. The Golden Tornadoes and Maple Leafs combined for a whirlwind of total attacks, with 205 combined, which is 53 more than Goshen’s previous match. In the first set, tied 11-11, the Golden Tornadoes embarked on a 13-6 run, creating a 24-17 deficit. Behind the efforts of Wahl, Rabadzhiev and Sauder, however, the Leafs rallied before ultimately falling 25-20. The second set opened with a 6-1 Geneva lead before Goshen reciprocated with an 11-6 run to tie the score at 12 all. A series of Geneva blocks, however, doomed the Goshen comeback, finishing the second with a 13-6 run of solid defense and kills. The third set would prove to tell a familiar story, with the Golden Tornadoes jumping out to a quick 7-2 lead before another Goshen rally. The Leafs closed the gap with to pull within three, 11-8, but were once again stymied by a succession of errors and Geneva kills. Despite standing on the precipice of defeat at 18-10, Goshen refused to back down, utilizing a combination of kills from Wahl and Rabadzhiev to pull within four before falling 25-20. In the second match, Geneva’s Spencer York led a well-balanced offense with 10 kills while Anthony Baronio contributed 29 assists. On the Maple Leaf side, Goshen was once again led by its dynamic duo of Wahl and Rabadzhiev, who chipped in 13 and 12 kills, respectively. Lucas Sauder remained the gasoline in the piston of the Goshen offense, contributing a match-high 30 assists. The two losses drop Goshen to 2-12 overall and 0-3 in the WHAC. A busy weekend schedule awaits the Leafs as they travel to North Park University on Friday and Lawrence Tech on Saturday.